Cabbage, or patta gobi, is one of the most celebrated vegetables in India. It is very leafy, made with each leave making a covering for the other. Light green and white in color, cabbage is a really simple vegetable to cook. There are a lot of varieties of cabbages available in the market which are different in shapes and sometimes even color. Cabbage is used for subzis, parathas, starters and a lot of other recipes, some of which are mentioned below. Cabbage is spectacular in terms that it can be stir-fried, fried or even steamed which makes it great for snacks. The slight pungent aroma and taste of cabbage is improved with urad dal and deep fried to perfection in Mini Cabbage Vadas. For something that is not deep fried and a little on the healthier side, Cabbage Jowar Muthias are perfect. It is a Gujarati snack that that is made healthier by using jowar flour and grated vegetables. Combined with chana dal and flavored mildly with mint leaves and cumin seeds powder, cabbage transforms into a wonderful tikki that is cooked with very less oil, called Chana Dal and Cabbage Tikkis. Cabbage, Carrot and Paneer Grilled Sandwich is a simple snack that comes to your rescue when you need something easy to make that does not even require that much time. The combination of those vegetables works wonders together and makes for a flavor bomb sandwich. Cabbage Foogath is a simple stir-fry subzi made with cabbage, topped with a lot of fresh coconut and mostly had in the southern states of India. This is also quite similar to the south Indian Cabbage Poriyal. Cabbage, mixed with a binding agent like nachni, makes delicious and healthy koftas. These, combined with a rich, silky gravy made with pumpkins and tomatoes gives us Cabbage Nachni Koftas in Makhani Gravy. An easy cabbage subzi that is made in Gujarati households is Cabbage Vatana nu Shaak. It is delicious, only takes a few minutes to prepare and uses the most basic spices that are easily available. Since most of cabbage subzis are basic stir fries, this next one is too but with a twist. Cabbage Masala is a healthy subzi that uses onions, Kashmiri dried chillies, cloves and cardamom. In today's social world, there are so many parties we go to and the food we take needs to impress. To do so, the food needs to be fun and easy to eat. Cabbage Stuffed Capsicum is not only innovative but hardly takes any time to make. The easy availability of these ingredients makes Cabbage Carrot Paneer Samosa Patti Snack perfect for parties, especially when served with schezuan sauce. The winning combination of carrot and cabbage when mixed with cheese and stuffed in a roti will give you the best tasting snacks in less time called Stuffed Cabbage Carrot and Cheese Rolls. Cabbage can be added to various parathas and rotis to give them a different texture and taste that is unique. Generally dal and gobi are not cooked together but this is an exception. In this Cabbage and Dal Paratha, the vegetable and dal is cooked together with ginger, garlic, fennel seeds and aromatics and then stuffed into parathas. For a nice, rustic flavor, a traditional rice bhakri is perked up with vegetables and turned into Cabbage and Carrot Rice Bhakri, which looks colorful and so much fun to eat as well. There are a lot of combinations of rotis that can be made too. Cabbage goes well with onion, methi and even oats which creates a variety of healthy options. A few of these are – Oats and Cabbage Roti and Nutritious Cabbage and Methi Roti. Some recipes are unheard of but when you read them, you just can't wait to eat them! Cabbage rolls in Tomato Gravy is one such recipe. Here, the cabbage leaves are used as an outer covering to stuff the vegetables in and then served with a tangy tomato gravy, sounds amazing right? Cabbage Pineapple Salad is a juicy and crunchy salad ideal for the summer, and so different that it pleasantly surprises everyone. Cabbage also adds a crunchy element to a basic tomato soup which is a great textural component. This elevates the Tomato, Cabbage and Bean Soup to a next level. 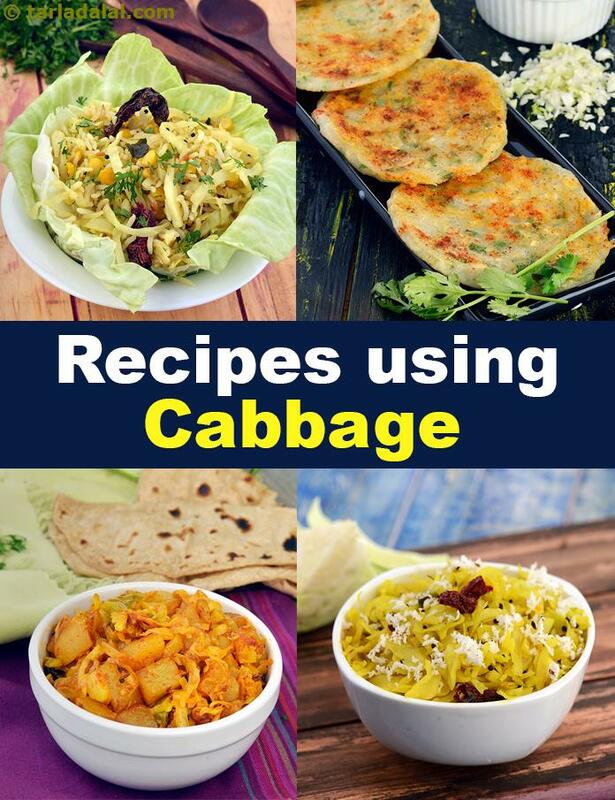 Enjoy our cabbage recipes | Indian Cabbage Recipes given below. In this simple, easy-to-make, elegant salad, the traditional calorie-laden mayonnaise dressing is replaced with a healthier version, made using low-fat curds and dill. Cabbage is a good source of vitamin C, while apples provide fibre, placing this salad high on the nutrition scale. A clear soup with crispy stir-fried spring onions, cabbage and capsicum. A sumptuous soup of nutritious vegetable stock thickened with white sauce, the cabbage, carrot and onion soup stands out because of the addition of chopped veggies that provide a refreshing crunch to creamy soup. As always, a dash of pepper is all it takes to flavour this wholesome soup. Cabbage rice is just the thing to make when you get back home late and wish for a quick-fix but filling dinner! sliced capsicum and a very mild dose of pepper are the only flavouring agents in this gentle rice and cabbage preparation. A sprinkling of cheese ensures that the meal is satisfying too. A versatile, traditional south indian recipe, which goes just as well with rice as with puris or chapatis. You will love these mouth-watering deep-fried vadas of crushed lentils and chopped cabbage, supported by a gentle combination of carrots, green chillies and coriander. Cabbage vadas will make a wonderful after-school snack for kids or a tea-time treat for elders. This is a dry vegetable dish made with cabbage. Other vegetables like beans, cluster beans, sabre beans, carrots etc can also be prepared in a similar way. One such dry curry is always served along with a traditional south indian lunch.